The Magribija Mosque, 16th c. CE, Sarajevo, Bosnia-Hercegovina – Photograph 2009 Via Wikimedia Commons. On Friday, October 28, a 23-year-old Slav Muslim from Serbia named Mevlid Jašarević fired an automatic weapon for 30 minutes at the U.S. Embassy in Sarajevo, the capital of Bosnia-Hercegovina. According to the Washington Post, Jašarević also carried hand grenades and had been arrested for theft in Austria in 2005 and for waving around "a large knife" during a tour of south Serbia by Western diplomats last year. No American personnel were injured in the Sarajevo incident, but a Bosnian policeman guarding the embassy was wounded. The embassy is a fortress-like structure erected well away from the center of the city after the Dayton Accords ended the Bosnian war in 1995. It is located at Number 1, Robert C. Frasure Street, named for a U.S. diplomat who was killed, with two other Americans, then-Deputy Assistant Secretary of Defense Joseph Kruzel and Air Force Colonel Sam Nelson Drew, in a driving accident on a mountain road above Sarajevo during the negotiations that led to the Dayton agreement. Jašarević's assault was stopped when he was shot by one of a group of Bosnian police who arrived at the embassy. The terrorist was treated at a local hospital and handed back to Bosnian judicial authorities on October 31. On November 2, as also reported by the Washington Post, two Bosnians, Dino Pečenković, 24, and Munib Ahmetpašić, 21, were arrested for having driven Jašarević to Sarajevo from the local headquarters of the ultra-fundamentalist Wahhabi sect, in the small northern Bosnian village of Gornja Maoča. Last year, Bosnian police raided Gornja Maoča, arresting eight extremists and seizing military equipment and explosives. When Jašarević carried out his attack, news reports showed him with the characteristic untrimmed beard and short breeches that hard-core Wahhabis wear in alleged emulation of Muhammad. This skirmish involving an obscure radical Muslim points to a neglected frontline zone in the Balkan struggle against Wahhabism. Jašarević comes from Novi Pazar, a Muslim-majority town in a small area known as "the Sandžak"—a Turkish word meaning "banner" and denoting an administrative district under the Ottomans—that is divided between Serbia and Montenegro. Novi Pazar, Sandžak, 2008 -- Photograph by Lumen Roma, Via Wikimedia Commons. Close observers of the Balkans have expressed concern about Islamist agitation in the Sandžak of late. Muslims from the Serbian area of the Sandžak call themselves "Bosnian" but speak a Serbian dialect, and their religious institutions have been contested. Until recently, although living in Serbia, they were subject officially to the spiritual jurisdiction of Mustafa Cerić, the Bosnian "grand mufti" located in Sarajevo and aligned with the Egyptian fundamentalist hate preacher Yusuf Al-Qaradawi. 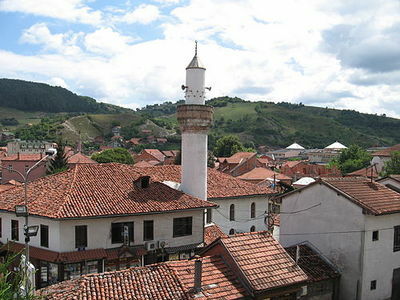 Sandžak Muslims are poor, rural folk and the object of derision by Muslims in Bosnia proper, who recognize them immediately by their Serbian idiom. On October 16, the president of Serbia, Boris Tadić, and Bakir Izetbegović, the Muslim representative in the three-member Bosnian presidency (which also includes a Serb and a Croat), announced an agreement under which the "Bosnian Muslims" living in the Serbian Sandžak would be united with the "Serbian Muslims" elsewhere in that country. The latter group had hitherto been governed from Belgrade, the Serbian capital, in a separate religious administration. Notwithstanding the horrors of the 1992-95 Bosnian war, at least 3.5 percent of Serbia's population is Muslim, totaling around 250,000 out of 7.3 million. 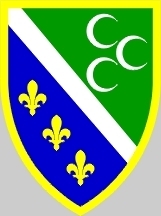 Shield of Sandžak Muslims in Serbia and in Montenegro. The joining of "Bosnian Muslims in Serbia" to "Serbian Muslims," was, according to Tadic and Izetbegovic, arranged by Mustafa Cerić and Mehmet Görmez, a Turkish Muslim cleric. Görmez last year became head of Turkey's state religious affairs directorate, or Diyanet. Imposition of unity on the Muslims in Serbia, who differ in their self-identification, and the involvement of a Turkish government representative in brokering the arrangement, has not been well received by Sarajevo Muslims. Bosnian Muslims in Bosnia accuse their "grand mufti" Cerić of selling out their Sandžak coreligionists, in the interest of an unethical deal with the Serbian government. 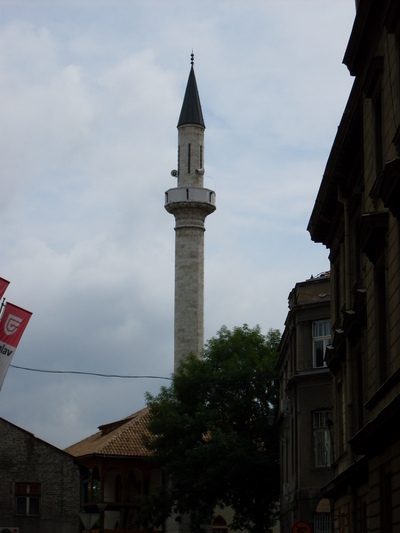 Further, the intrusion of the Turkish Diyanet and Görmez in the Sandžak stirred lively condemnation by Bosnian Muslim intellectuals, similar to recent protests over Turkish meddling in the affairs of the Muslim communities of Macedonia, where Islam is a minority faith, and Kosova, where it represents the overwhelming majority. Turkish prime minister Recep Tayyip Erdoğan, in a state visit to Macedonia in September, prayed publicly at a Sufi shrine that has been vandalized and occupied by Wahhabis. As head of the Diyanet, Görmez reports to Erdoğan. Turkish religious outreach in the Balkans as well as in the large Turkish emigrant communities of Germany and the Netherlands is guided by the politicians in power in Ankara, representing Erdoğan's Justice and Development party, known by its Turkish initials as the AKP. In Kosova, Erdoğan's foreign minister, Ahmet Davutoğlu, and his education minister, Ömer Dinçer, have called for revision of local textbooks to provide a more favorable picture of Turkish dominion over the Balkans, from the mid-14th to the early-20th centuries. Kosovar historians have protested that textbooks should not be changed to accommodate Turkish demands. 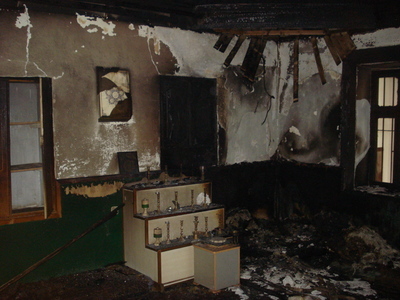 Arson damage at the Harabati Baba Bektashi Shrine, 2010 -- Photograph by the Bektashi Community of the Republic of Macedonia. When news arrived in Bosnia that the Sandžak Muslims had been handed over to control by Serbia, reactions were much sharper. A blog, Glasnik Nacionalnog kongresa Republike BiH (the Newsletter of the National Congress of the Republic of Bosnia and Herzegovina, which is a political group rather than a legislative institution), is well-known for its sharp criticism of corruption in Bosnian politics. Unfortunately, it appears only in Bosnian. But in its October 17 issue, it included an article by one Vahid Sendijarević, declaring "Turkey was only an occupier in Bosnia-Hercegovina and cannot be trusted," and denouncing Turkish mediation between the Bosnian Muslims and Muslims in Serbia. From a Muslim intellectual, such language was startling. Sendijarević stated, "Turkey's relations with Serbia were always more important than the fate of the Muslims in Serbia and the Muslims in Bosnia, and of Bosnia itself." He pointed out that during the 19th century, the Ottomans granted autonomy to Serbia, including the right of Serbia to expel its Muslims, but turned "uncontrollable" Bosnia-Hercegovina over to the Habsburg empire. Sendijarević added, "Turkey thinks only of the interests of one nation, the Turks." He concluded, "the worst trickery played in Bosnia-Hercegovina today is symbolized by Cerić, who issued the policy statement, 'Turkey is our mother,' meaning that the Turks are our guardians and have a green light to interfere in our affairs and decide things on our behalf." Bosnians perceive that Turkey is undergoing an economic boom and that Serbia has been promised entry into the European Union, while Bosnia-Hercegovina sinks deeper into poverty and unemployment, with an increasing brain drain of its educated youth, who yearn only to emigrate, with no hope of their country's acceptance by the EU. With his Wahhabi beard, short pants, and automatic weapon, Mevlid Jašarević from Novi Pazar was motivated probably more by hatred of the West than outrage at Bosnian Muslim machinations in his community, when he fired at the American Embassy. But the little strip of land in south Serbia called the Sandžak bears watching, as it becomes a new theater for the intrigues of Erdogan's government, and a place where distant clashes half-glimpsed by outsiders may produce major consequences in an increasingly chaotic world.